West Hills Animal Hospital & Emergency Center is a 24 hour emergency and critical care center. We are equipped to handle any pet emergency or critical care situation 24 hours per day, 365 days per year. 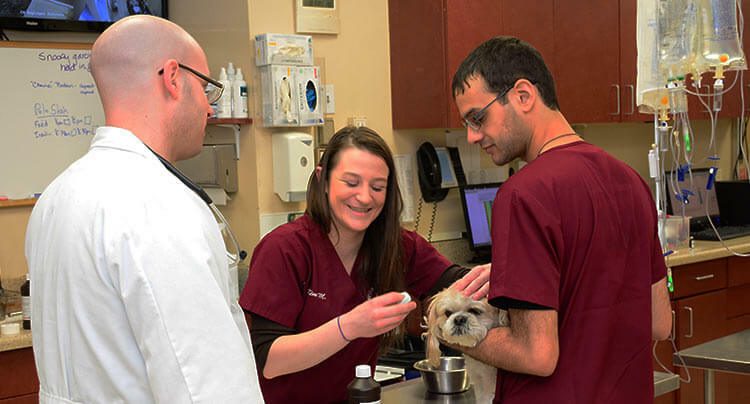 We have a team of trained, caring veterinarians and a technical staff who possess the skills, knowledge and experience to provide an extraordinary level of care to your pet. Many veterinarians in the area refer their emergency calls to the West Hills Animal Emergency & Critical Care Center when they are closed or unavailable. Often times a practice will send a patient for continued care overnight rather than leave them unattended in their own practice. Referring you to our practice is the best way that your veterinarian can ensure your pet will receive the highest quality care by a team of knowledgeable, caring and committed professionals. All diagnostic testing performed, medical records, as well as a case summary, will be immediately sent to your veterinarian to ensure continuity in care. We treat every patient as we would our own and strive to treat every client as we would like to be treated ourselves. During emergencies it is crucial to have the right information on hand as quickly as possible. At West Hills Animal Hospital & Emergency Center, our veterinarians and staff have full, immediate access to diagnostic results with our comprehensive in-house analyzers and equipment. We have complete access to all of the patient files of all of our satellite hospitals as well. With quick and easy access to your pet's complete medical history, we can ensure your pet will receive the best treatment they need in a timely manner. In our eyes, if you are concerned about your pet and want your pet to be looked at by a veterinarian, it is an emergency. Some emergencies are easily recognized, while others are not easily recognized but may be as life-threatening for your pet. For more information about our 24 hour emergency hospital, please visit our emergency website, West Hills Animal Hospital & Emergency Center (www.whaecc.com). To see a list of pet emergencies for which you should immediately seek medical care, please visit our pet emergencies page.